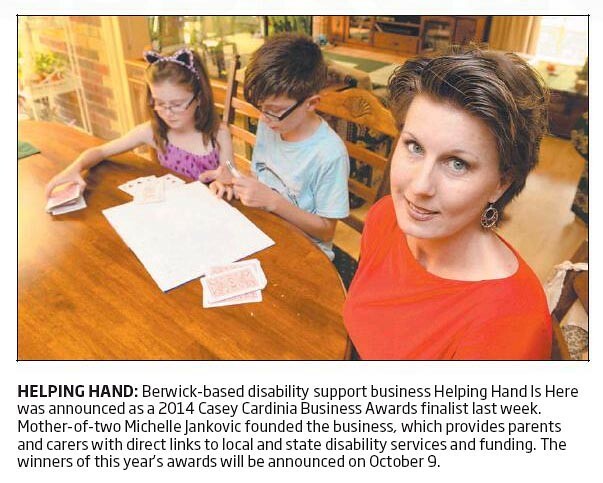 HELPING HAND: Berwick-based disability support business Helping Hand Is Here was announced as a 2014 Casey Cardinia Business Awards finalist last week. Mother-of-two Michelle Jankovic founded the business, which provides parents and carers with direct links to local and state disability services and funding. The winners of this year’s awards will be announced on October 9. For more information about Helping Hand Is Here, connecting you to disability support services, visit www.helpinghandishere.com.au or phone (03) 9017 4649.